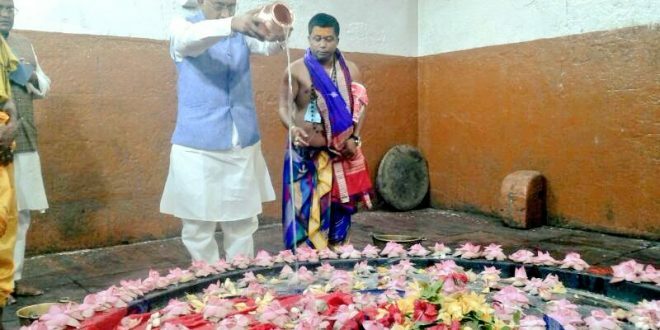 Bhubaneswar: Union Minister Vijay Goel has landed in controversy after he posted some photographs of the sanctum sanctorum of Odisha’s Lord Lingaraj Temple on his Twitter page. Although Goel withdrew the pictures, which were taken in a restricted zone, the opposition parties demanded his unconditional over the controversy. The pictures were taken last year when Goel visited the temple and performed rituals inside the “Garva Griha” of the 11th-century shrine. Goel said he had by mistake tweeted pictures of the Lingaraj Temple from his trip last year. “Yesterday on the occasion of #UtkalaDibasa, I had by mistake tweeted pictures of the Lingaraj Temple from my trip last year. I did not wish to hurt anyone’s sentiments and therefore, I am withdrawing the tweet/images,” tweeted Goel. He had posted the pictures yesterday on Twitter while wishing the people of Odisha on the occasion of Utkala Dibasa. However, BJD Rajya Sabha member Prasant Nanda said the photo was “against the religious tradition”. “The minister should tender an unconditional apology to the people of Odisha for the incident,” Nanda said.